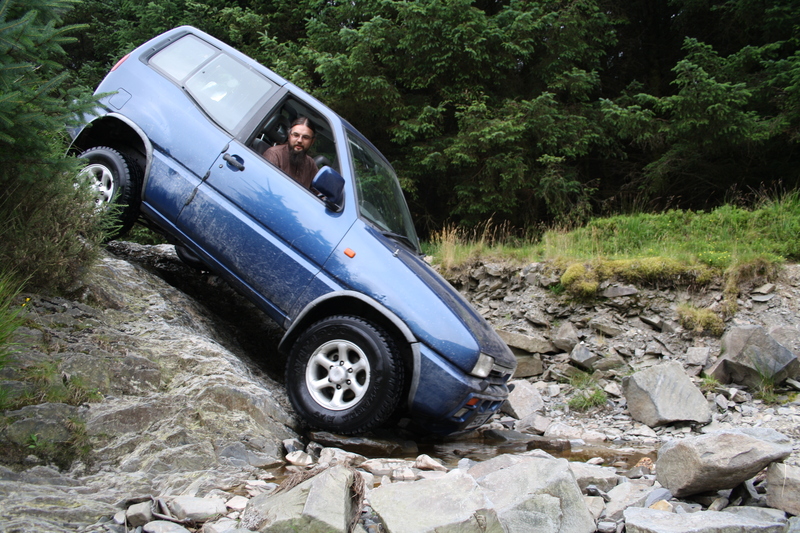 Project Budget 4×4: Strata Florida – HubNut – celebrating the average! Strata Florida is one of the legends of greenlanes, though I’ve never been entirely sure why this is. Sure, it’s good, but there are other lanes around that are just as challenging and just as scenic, if not more so. However, it beats the M25 and the other evening, I finally got to explore it in my Budget 4×4 Ford Maverick. It was an entirely Japanese outing actually, with a much-modified Maverick and a mildly tweaked Suzuki Grand Vitara joining me. We started at the Pontrhydfendigaid end, passing the legendary abbey ruins that give the lane its name. That name is either the Latin for Vale of Flowers, or an Anglicised version of the Ystrad Fflur which means Valley of Flowers. No surprise that the two are so close as Latin would have been the official language of the Abbey. Founded in 1164, it was a victim of Henry VIII’s Dissolution of 1540. However, it’s not that close to the start of lane, which is further into forestry land. From the start, it’s a rocky lane and immediately, the cushioning all-round coil springs of my Range Rover – the last vehicle I drove down this lane – were sadly missed! The Maverick uses stiff torsion bars up front, with a fairly-flexible but still-firm coil sprung live axle at the rear. It’s really not comfortable over this sort of terrain. Not that the Maverick seemed to mind. It pottered along as I picked what I thought was the best line through the rocks, only bottoming out a few times. That underbody protection – standard fitment but not really designed for big knocks – is thankfully good at preventing damage. It was very much a job of keeping the thumbs well clear of the steering wheel spokes. This is often a first lesson in off-roading and the reason is simple. If the steering kicks back – which is more likely over rocky tracks – you’ll snap a thumb in no time at all if it’s inside the rim of the wheel. The famous bombhole was dispatched with little trouble, though I did re-arrange the rocks at the bottom to avoid clouting the bumper. Short overhangs were a major boon here and I avoided damage. The Range Rover wasn’t quite so lucky, bending the number plate and catching the tow bar here. Nothing major, but the Maverick was entirely unscathed. Then my pal in the modified Maverick though we’d better drive back up the bombhole. I’d not done this before but the Grand Vitara made it up with a touch of wheelspin (it lacks a limited slip rear diff) and the modified Maverick also made it – albeit with a second attempt necessary. Would I make it? As it happens, yes I did, though I rather overdid the power. My usual way to deal with an obstacle is to make sure momentum is maintained. When you’re climbing a rock face that’s well over 30 degrees, I felt I needed a fair chunk of momentum. I was still in low first, so that’s still not very fast at all, but the ride up was a bit rough! My tools were flying around in the back, reminding me that I really need to find a way to secure them (they are in a bag, but the bag flew quite merrily!). We bounced our way to the end and then also tackled Soar y Mynydd (so-ar uh mun-uth). This is a very pretty lane, with some very loose rock on a couple of steep climbs. I took these gently and let the limited slip diff do its thing – preventing either of the heavily-loaded rear wheels from spinning excessively. No problem. Then it was a matter of driving home, where the Maverick reminds you that while it isn’t very compromised off the surfaced road, it’s also exceedingly well mannered upon it.